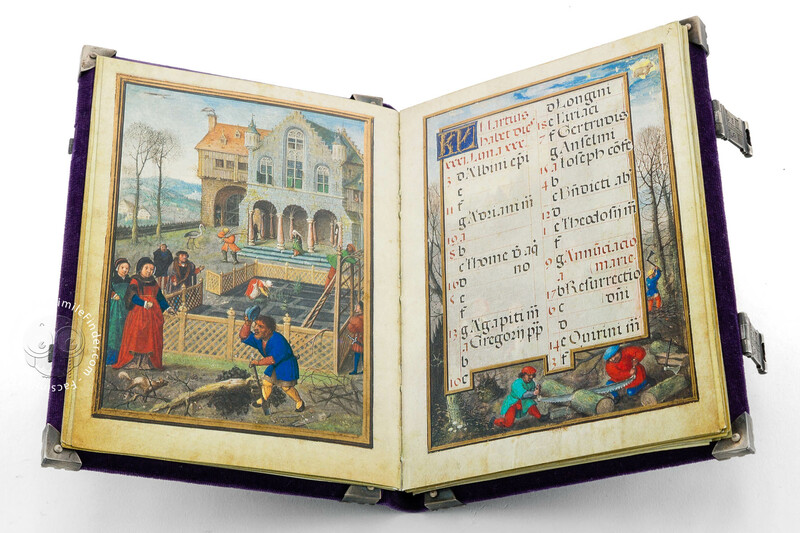 Simon Bening’s Flemish Calendar which consists of the calendar part of a Book of Hours, thus a fragment, presents one of the most beautiful landscape cycles ever seen in a calendar. 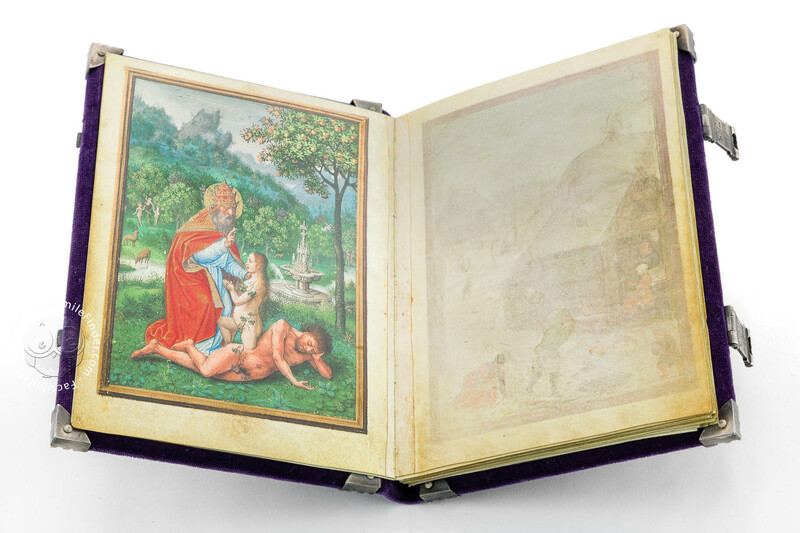 It is not only a landmark in Flemish book illumination of the 16th century but also a highlight in Bening’s own personal development as an artist and landscape painter. 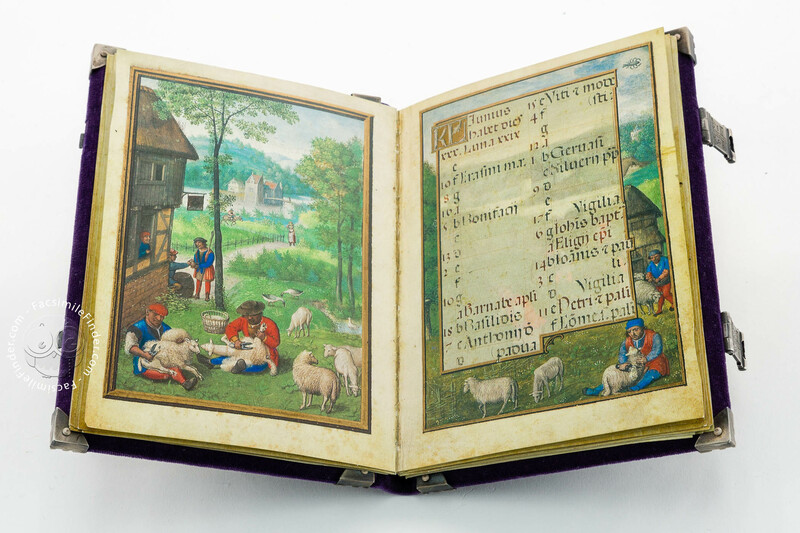 Calendars are those sections at the beginning of a devotional book which list the diverse feast days of the Church year. The individual months are traditionally symbolised by seasonal occupations and by the signs of the Zodiac associated with each individual month. 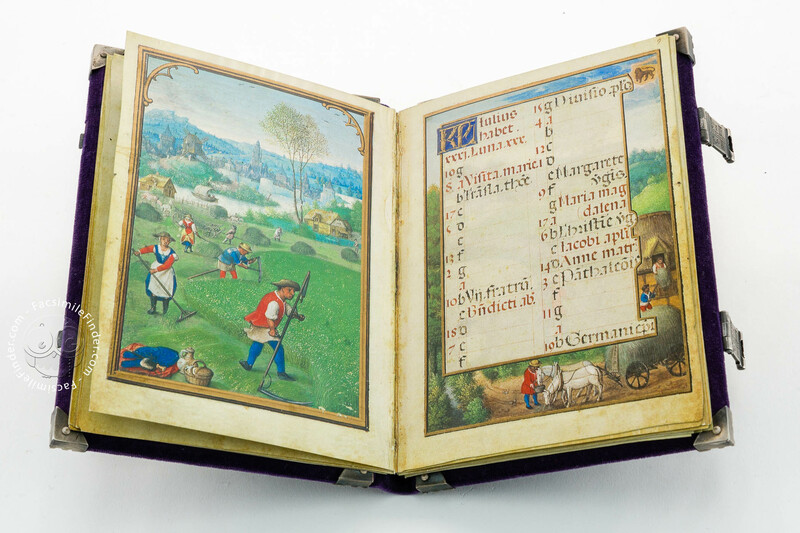 As the seasonal activities – mostly agricultural activities like labouring in the fields – take place in the open air, medieval calendars often used landscapes or landscape sections for their decoration. In the late Middle Ages, a new conception of nature influenced the development of landscape painting in illuminated manuscripts. 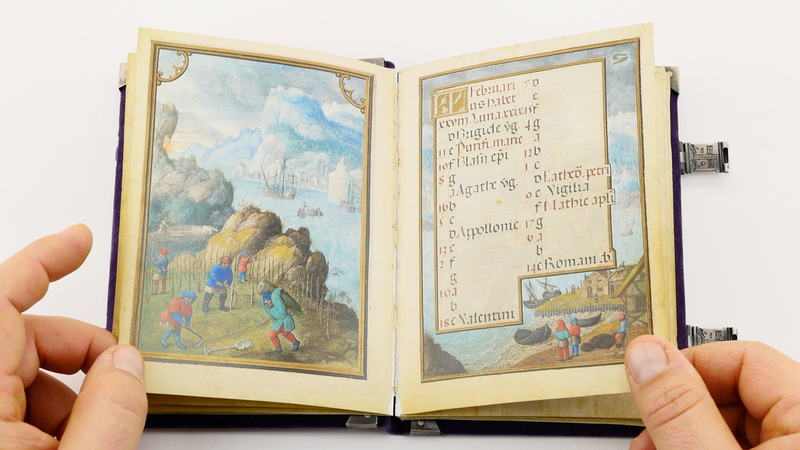 In general, a calendar contained eleven landscape miniatures. One or two were often reserved for domestic interiors. 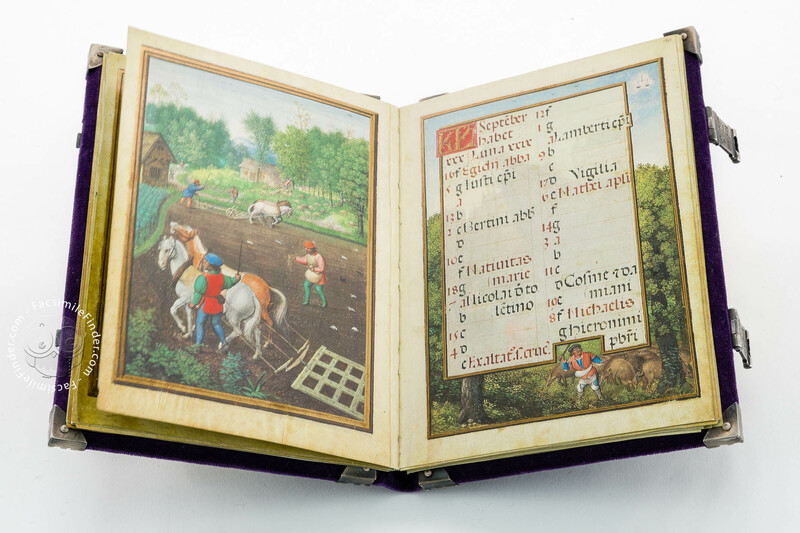 Simon Bening revolutionized the pictorial language used in calendar miniatures. He attached as much importance to calendar decoration as to the detailed programmes of devotional miniatures which usually followed them. 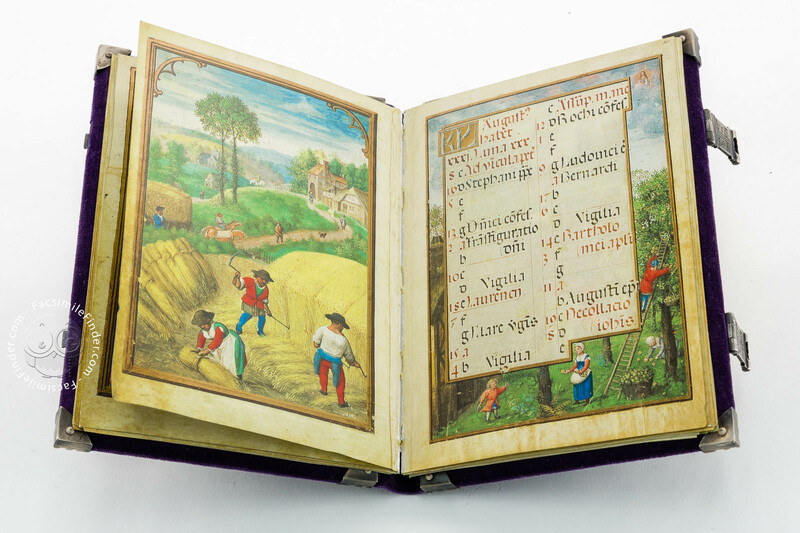 Illuminated Book of Hours or prayerbooks often used a small strip below the text for illustrations. Bening, however, was the only artist in his century who painted full-page calendar miniatures, and he was the first to treat them as independent depictions which, to his mind, should convey a life-like picture of the environment. Bening also was the only artist before Pieter Brueghel the Elder to explore landscapes in a systematic way. He painted different landscape types in a stunning topographic diversity and also described the most different weather conditions. His landscapes are lyrical, observed with sensitivity, composed in detail and full of atmosphere. They are Bening’s important contribution to the increasing prestige attributed to Flemish landscape painting. 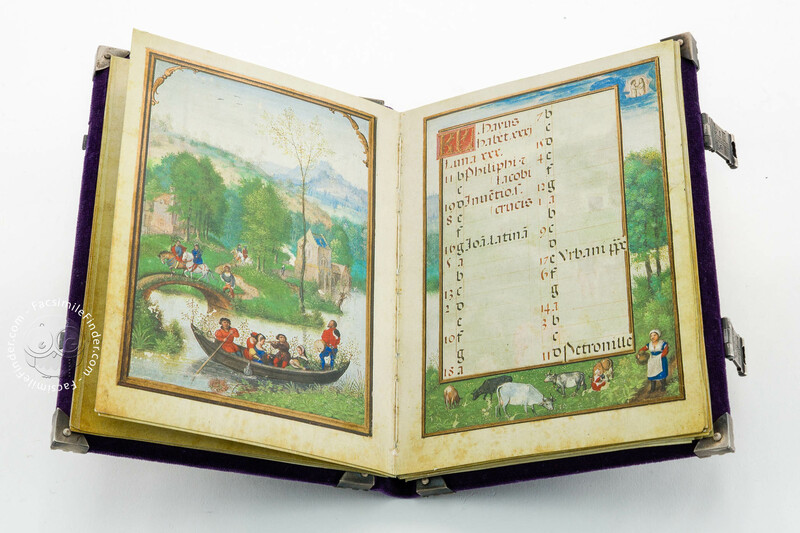 This lyrical calendar of Bening’s presents a busy and harmonic society. 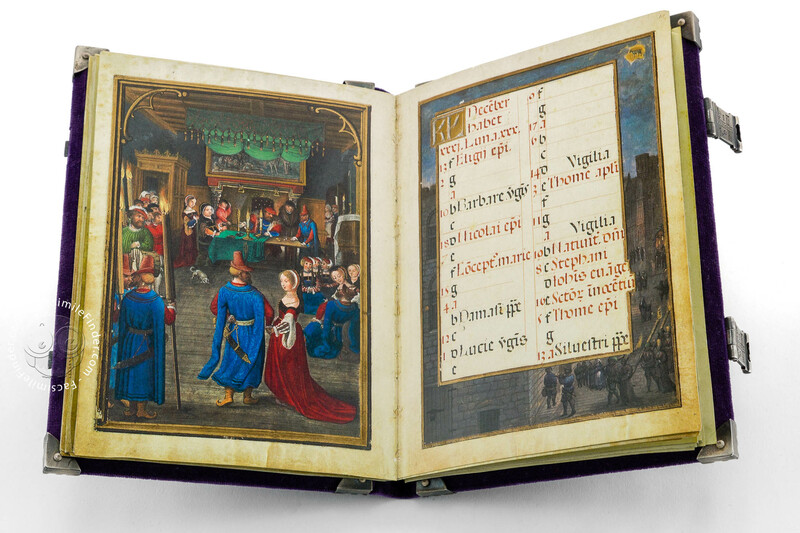 Some of the miniatures show the typical activities or pleasures of the relevant month besides social events. However, in comparison to other manuscripts the importance of traditional seasonal activities in this calendar is reduced. More room is dedicated to the delights of the upper class. These miniatures show a closed structure, subtle tones and atmospheric effects which are very unusual in Flemish art at the time. 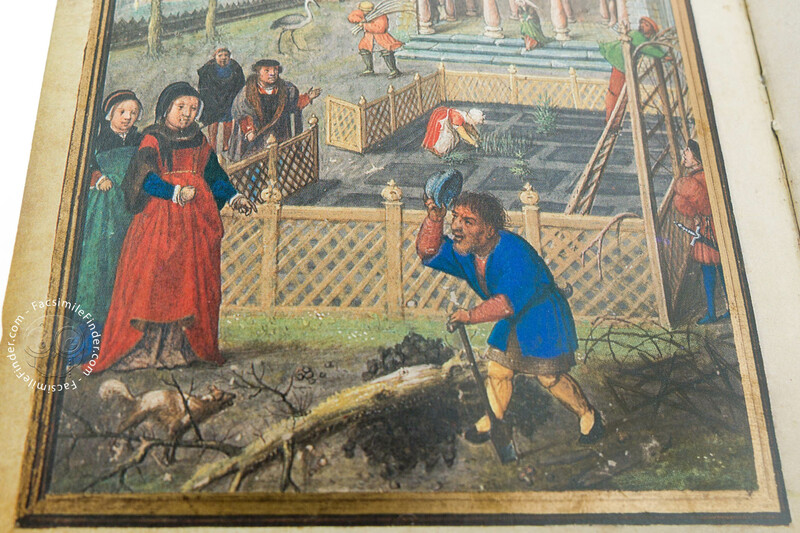 The month of January shows a lumberjack working outside and a group of persons warming up in front of a fireplace in a nearby interior; both activities symbolise winter. 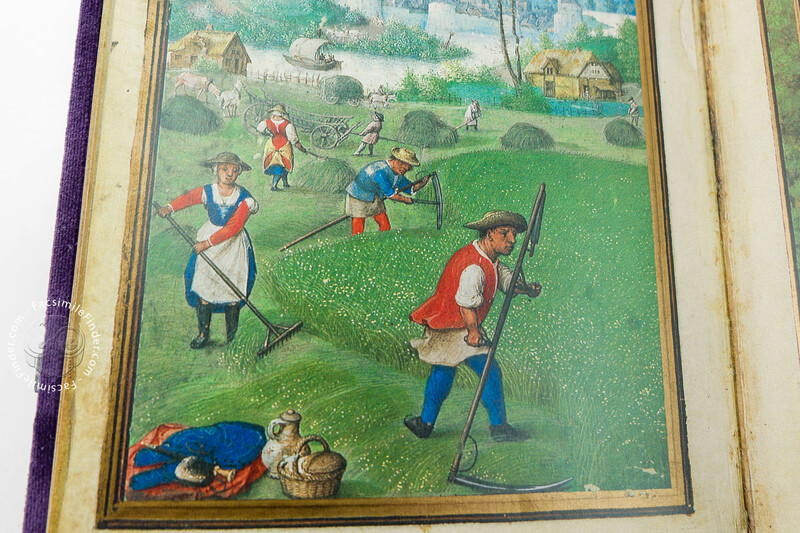 Behind and around the house, peasants are working in a snow-covered village. 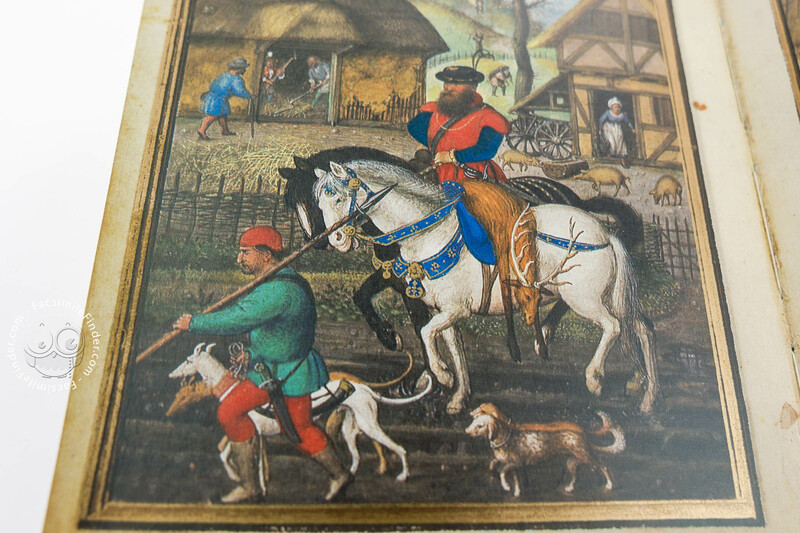 Pictures of Flemish landscapes alternate with other motifs such as love and courting. 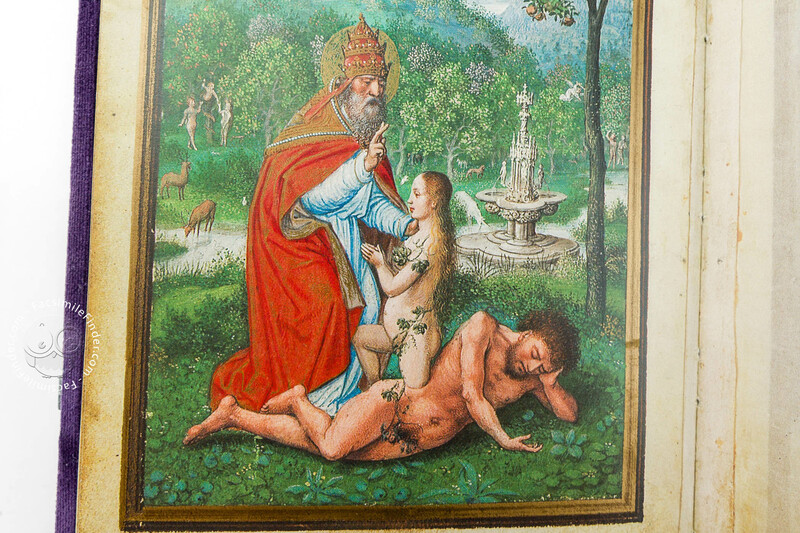 Such "romantic" motifs have always been part of Flemish calendar iconography. 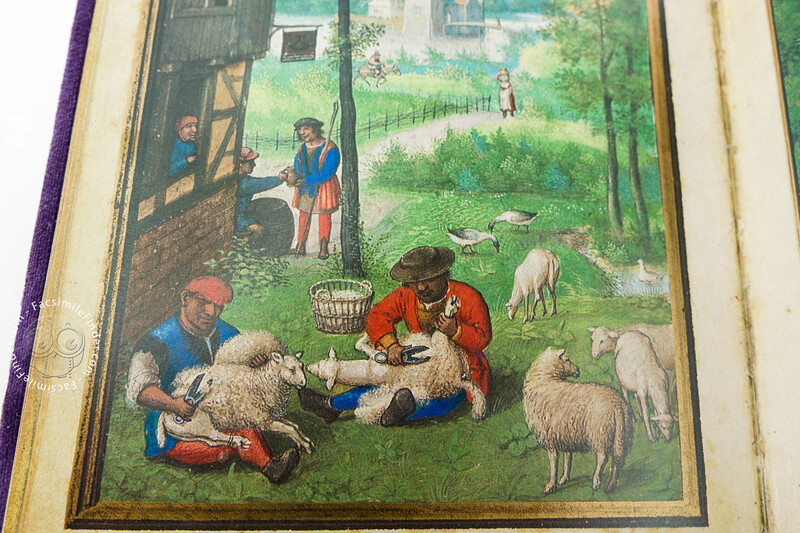 The elder versions often contain one or three of those scenes. In our case, there are three romantic scenes: lovers in a garden, a couple in a boat, and a ball in an elegant Flemish house. 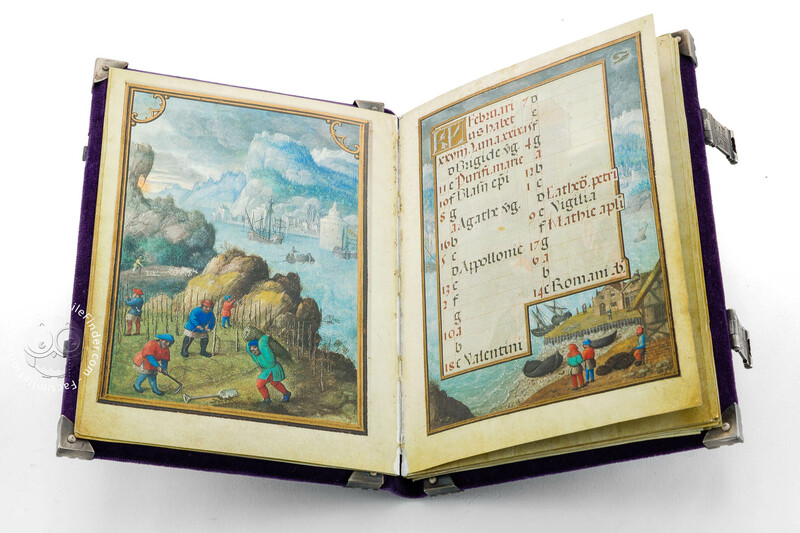 Simon Bening found a new form for calendar miniatures by creating twopage depictions, with the intention to enlarge both middle ground and background. This should be the starting point of a development which, in its final consequence, was to culminate in the landscapes of Pieter Brueghel. 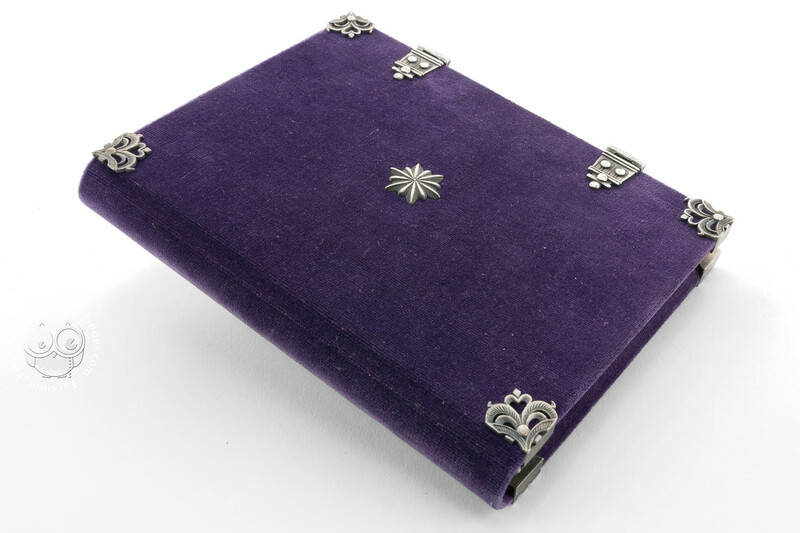 Purple velvet decorated with twelve rosettes, corner-fittings and clasps from massive sterling silver. Manuscript book on parchment − 14 × 10.4 cm − 60 pp. 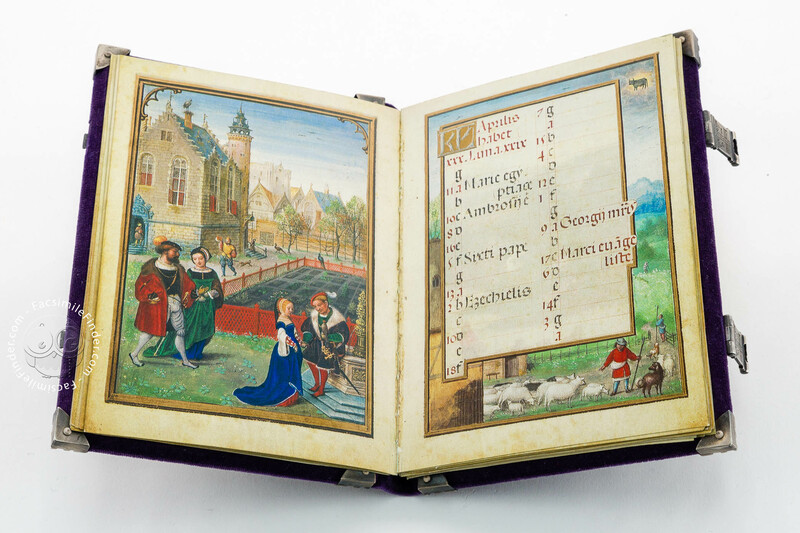 Full-size color reproduction of the entire original document, Simon Bening’s Flemish Calendar: the facsimile attempts to replicate the look-and-feel and physical features of the original document; pages are trimmed according to the original format; the binding might not be consistent with the current document binding. 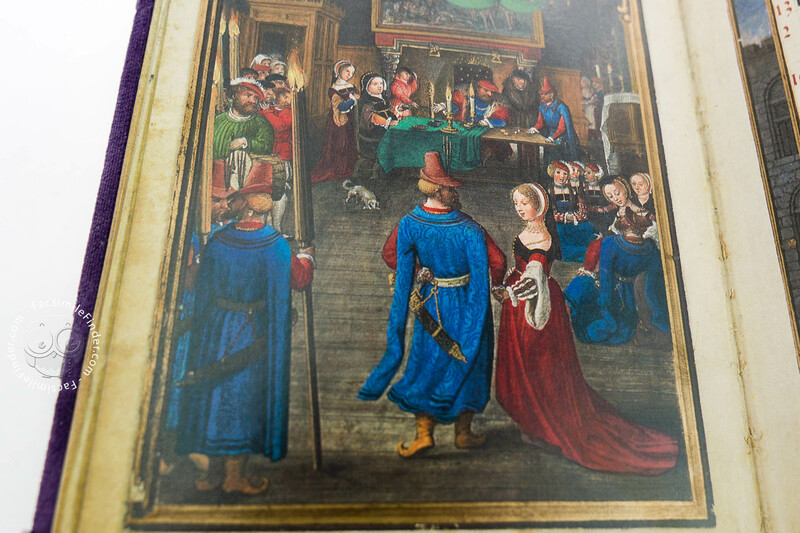 The facsimile edition includes a commentary volume of more than 480 pages which explains the manuscript and its artistic background in three languages. 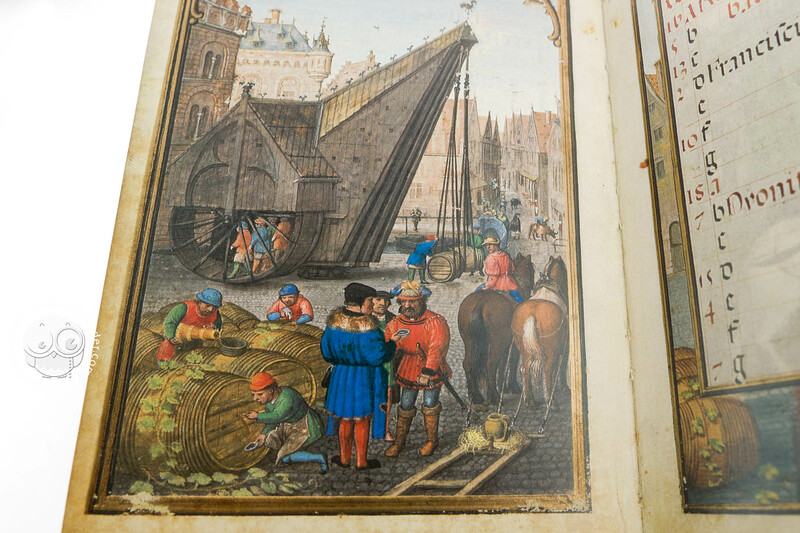 It offers interesting insights into the development of landscape painting in Flemish book illumination and provides an analysis of the miniatures, while also explaining the texts of the codex. 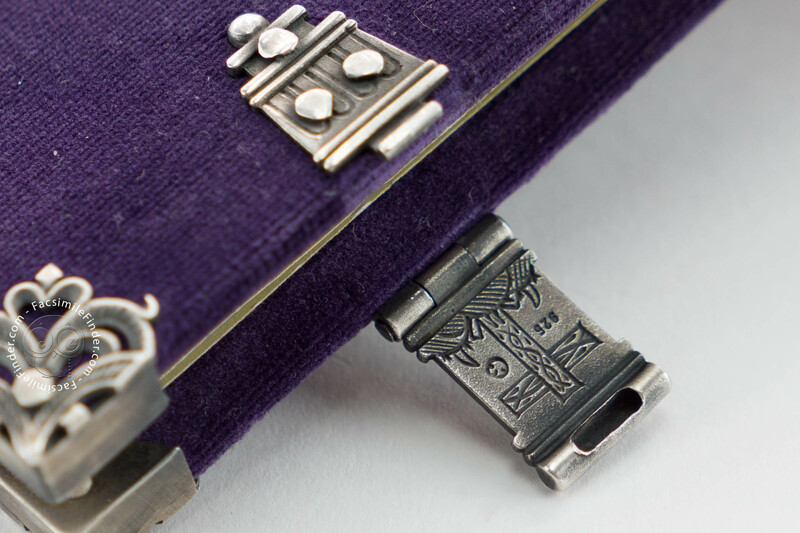 The binding has been manufactured in full accordance with the original. 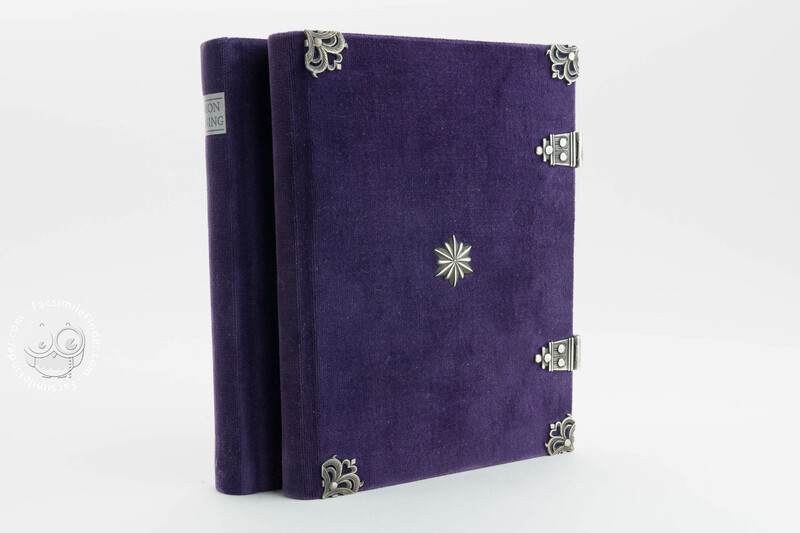 The book is bound in purple velvet and decorated with twelve rosettes, corner fittings and clasps from massive sterling silver. The headband is sewn by hand.